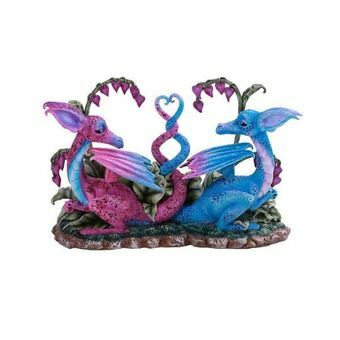 This delightful pair of dragons is in love, and will bring some affection and color into your home! The figurine is based upon the artwork of Amy Brown. Two little drakes sit under a Bleeding Heart plant, their tails entwined to form the symbol of their love. One of the adorable beasties is a bright shade of pink, and the other sky blue. A wonderful gift idea for your favorite couple or loved one!